But even I know that man cannot live by red meat alone. In fact, since a few of my friends have had health scares in recent years that can likely be traced to eating a bit too much red meat, I’ve been doing my best to be more moderate in how often I’m cooking burgers and eating burgers when we eat out. Not to worry. I make a mean chicken sandwich, too. 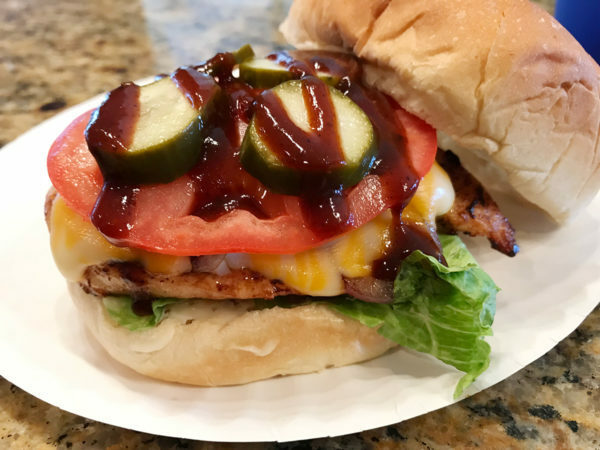 This one that I made not too long ago is basically my primary cheeseburger, but with a chicken breast instead of ground beef. Pretty much everything else is the same: garlic mayo, lettuce and tomato, grilled onion covered with melted Colby Jack cheese, pickles and BBQ sauce. Doesn’t that look delicious? It was so freaking good. It’ll definitely be on the menu when I get around to opening my restaurant.